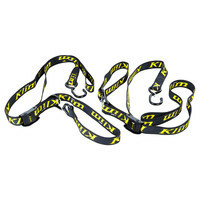 Made from 1 1/8″, 100% nylon webbing and constructed with the most durable components on the market. Featuring dual locking clips and a cam style buckle providing convenience and security to your motorcycle, ATV, or snowmobile. The soft-end protects handle bars from any scratches or scuffs. Adjusts from 24″ to 78″ and 1,200 lbs. tensile strength.